Trigger a notification to a user based on an event from another integration. For example, if a user purchases something in store and you would like to send them an offer, you could send them a coupon code. Onboarding: User opens app for the first time. Trigger an email after a delay for feature education. Drip campaign - multiple emails. Insert a record in CRM. Retention: Reward user when they reach a goal. Trigger an email with gift certificate. Trigger an SMS with gift certificate. Reactivation: User uninstalls the app. From the Airship dashboard, open the project you would like to connect to Zapier. Click Settings, select APIs & Integrations, and copy the App Key and App Master Secret for use in the next step. Install the Airship app, and paste the Airship App Key and App Master Secret in the Zapier account connection screen when prompted. Note: To use Triggers you will need Airship Connect. The Zapier integration automatically sets up the Connect integration. No additional steps are required. Actions and Searches are included with Airship messaging. To automate based on email we recommend setting the Named User as the customer's email address. You can also set other ids using associated identifiers (Connect Only). In order to trigger an SMS a E.164 formatted phone number must be used. Phone Number use associated identifier with key = com.urbanairship.phone_number and value = E.164 formatted phone number, e.g., +15555555555. Use the following code to send over a phone number. 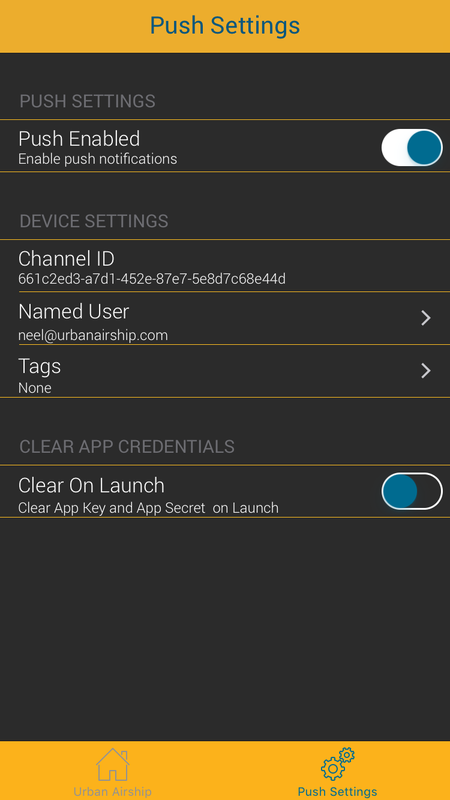 Use our 1st Flight App to send yourself test notifications and to easily find your channel_id, and set your named_user and tags for use with Zapier Triggers, Actions, and Searches. After completing the 1st Flight App setup, open the app on your mobile device, tap the Push Settings menu at the bottom of the screen to access the following options. Tap Channel ID to copy it to your clipboard. Tap Named User, tap the Named User field, then enter an email address. Tap Push Settings at the top of the screen to return to the Push Settings menu. Tap Tags, then tap the + sign in the upper right corner of the screen. Tap the Add Tag field, enter your custom tag, then hit the Enter button on the keyboard. After entering each tag, you will return to the list of tags. Please see the linked documentation for each of the Zapier concepts listed here. "Triggers answer the question: What events can my users listen for with Zapier?" "Actions answer the question: What should my users be able to create via Zapier?" "Searches answer the question: What records can I lookup by a particular query?" Example template uses are provided here. Please also see Zapier's documentation about How To Use Zap Templates. Make it easy to keep your users up-to-date with any changes to your product by sending a notification when an RSS feed is updated. An item is created in the RSS feed. Airship sends the item to all users in your app. Stay up to date on all new accounts created in Salesforce by sending an app notification to a group of users. Airship sends the account information as an alert to users in your app. Use Google Sheets to trigger an alert to users in your app. For a selected Google Sheet, add alert text and the tag you’d like your notification to apply to. Airship sends the alert text to all users that have that tag. You worked hard to acquire your customers. Use this Zapier integration to win back users that uninstalled your app. By engaging with users that uninstalled your app, you may be able to address the reasons why they left. A user uninstalls your app. You send a notification to that user. Airship sends an uninstall event. Zapier sends an email to the user asking for feedback. Send an SMS with a coupon code to users that hit a goal in your app. A goal is attained in the app, and a custom event is then triggered. Filter on only purchase events. Twilio sends an SMS to the matching users.